Eeva is a lawyer by training, but has a broad background in providing strategic business, policy, governance and legal insight and advice to various government, public, private and not-for-profit agencies. As President of Roots 2 STEM, she manages human resources and on-boarding of consultants and volunteers. She contributes to the development and implementation of organizational strategies, policies and practices. She supports the Roots 2 STEM team in achieving operational excellence and providing efficient service which meets the needs of its clients. Eeva, a native Calgarian, holds degrees in psychology and law, both from the University of Calgary. 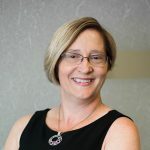 She has always welcomed being part of learning organizations and has been a facilitator for certification and designation programs at Columbia College, and the policy analyst at the Calgary Board of Education. In keeping with her drive for life-long learning, Eeva received the Certified In-House Counsel, Canada Designation from the Rotman School of Management in 2015. As a lover of puzzles, Eeva can often be found problem-solving with the students and demonstrating a critical thinking, growth mindset.